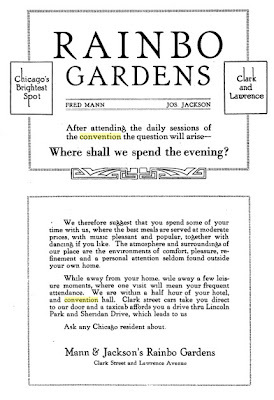 After attending the daily sessions of the convention the question will arise: Where shall we spend the evening? We therefore suggest that you spend some of your time with us, where the best meals are served at moderate prices, with music pleasant and popular, together with dancing if you like. The atmosphere and surroundings of our place are the environments of comfort, pleasure, refinement and a personal attention seldom found outside your own home. Mann & Jackson's Rainbo Gardens!